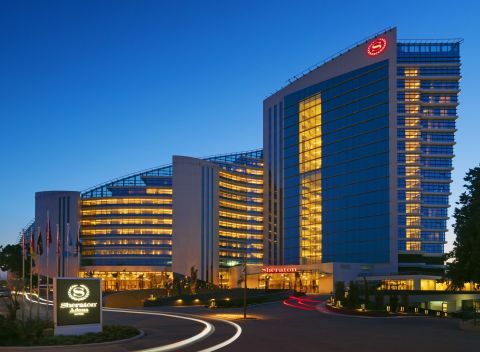 Starwood Hotels & Resorts Worldwide, Inc. (NYSE:HOT) has today announced the official opening of its tenth hotel in Turkey, the Sheraton Adana Hotel, in partnership with SERKA Turizm A.S., an Adali Holding Company. The new Sheraton Adana Hotel will be ideally located on the bank of the Seyhan River in the centre of Adana, Turkey’s fifth largest city located in the southern region of the country. Located 4.5 kilometres from Adana Sakirpasa Airport, within walking distance of Merkez Park and in proximity to Optimum Outlet, the city’s most central shopping mall, the 17-storey Sheraton Adana has 240 rooms including 18 suites, all offering an excellent sleep experience with signature Sheraton Sweet Sleeper(R) beds. In addition, guests staying in Sheraton Club rooms have access to the Sheraton Club Lounge on the 10th floor to enjoy breakfast, afternoon tea and evening cocktails with stunning views over the Seyhan River and Sabanci Merkez Camii, Turkey’s largest mosque with its six beautiful minarets. Guests can enjoy a range of cuisines – including the local specialty, the Adana Kebab – with restaurant options ranging from all day dining restaurant La Spezia offering international and Turkish cuisine to signature seafood restaurant Villa Mare which serves seafood accompanied with a view over the Seyhan River and the city of Adana. In addition, the Link Caf’e has a menu of homemade sweet delights accompanying afternoon tea while the Brook Bar offers refreshing cocktails by the pool. Score Fitness, the hotel’s fitness facility features a sauna, steam room and Turkish hammam for optimum relaxation. Guests can also enjoy wellness, beauty, massage and spa programmes in one of the eight treatment rooms in Puri Spa. For business or major events including weddings, the banquet area of Sheraton Adana offers more than 2,000 square metres with a ceiling height of 11 metres featuring a Grand Ball Room and a Junior Ball Room. The Grand Ball Room spans 1,000 square metres and can accommodate up to 700 guests. A boardroom and four conference rooms complement the offer for smaller group meetings. The hotel lobby also features the Link@Sheraton(R) experienced with Microsoft(R) – a signature social technology hub where guests can enjoy complimentary WIFI and stay connected. There are currently 10 Starwood hotels in Turkey, representing five of its lifestyle brands. These include four hotels in Istanbul: Sheraton Istanbul Maslak Hotel, Sheraton Istanbul Atakoy Hotel, W Istanbul, and Le M’eridien Istanbul Etiler. Outside of Istanbul, Starwood’s portfolio includes Sheraton Adana Hotel, Sheraton Cesme Hotel, Resort and Spa, Sheraton Ankara Hotel & Convention Centre, and The Lugal, a Luxury Collection Hotel, Ankara. The company entered Bursa in 2013 with Sheraton Bursa Hotel and Aloft Bursa Hotel, introducing the fast-growing Aloft Hotels brand into Turkey. Starwood will enter the emerging coastal city of Samsun with a Sheraton hotel as well as open Sheraton Istanbul Atasehir on the Asian side of the city in 2015, reinforcing Turkey’s position as one of the largest markets in Europe for the Sheraton brand. The company will also introduce the St. Regis and the Four Points by Sheraton brands into Turkey with The St. Regis Istanbul and Four Points by Sheraton Istanbul Batisehir Hotel next year, further expanding Starwood’s presence to seven hotels in the dynamic gateway city. Sheraton helps guests make connections at more than 400 hotels in nearly 70 countries around the world. The brand recently completed a $6 billion global revitalization and is now in the midst of an $8 billion global expansion over the next three years. Sheraton is owned by and is the largest and most global brand of Starwood Hotels & Resorts Worldwide, Inc., one of the leading hotel and leisure companies in the world with nearly 1,200 properties in 100 countries and 181,400 employees at its owned and managed properties. Starwood is a fully integrated owner, operator and franchisor of hotels, resorts and residences with the following internationally renowned brands: St. Regis(R), The Luxury Collection(R), W(R), Westin(R), Le M’eridien(R), Sheraton(R), Four Points(R) by Sheraton, Aloft(R), and Element(R). The Company boasts one of the industry’s leading loyalty programs, Starwood Preferred Guest (SPG(R)), allowing members to earn and redeem points for room stays, room upgrades and flights, with no blackout dates. Starwood also owns Starwood Vacation Ownership, Inc., a premier provider of world-class vacation experiences through villa-style resorts and privileged access to Starwood brands. For more information, please visit www.starwoodhotels.com.